There is fresh snow on the high mountain ridges, a bone chilling wind from the west rattles the tamarack, scattering golden needles across the forest floor. Tendrils of silver fog accent the hush that lies over the valley floor; winter is fast approaching and all of nature prepares. bed down and hardly stir until they arise again in the spring. As true hibernators, their body temperatures drop to near ambient and heart rates slow dramatically as they experience a deep comatose sleep state of torpidity. However, these animals will periodically rouse themselves from their deep slumber to eat stored food, quench their thirst, and to urinate or defecate. Rodents sleep very deeply while others slumber more lightly. winter sleep, yet it is not true hibernation but rather a winter dormancy. During a bear’s winter sleep, its heart rate decreases only slightly and body temperature drops only a few degrees from normal. Usually the bear will not awaken during this extended deep sleep and therefore they do not drink, eat, exercise, or defecate and will remain in their den for the entire winter. Hibernating bears are quite an amazing biological wonder. Although they are completely inactive all winter, they do not suffer muscle atrophy or bone loss as a human would. Bears’ bones continue to grow during their winter sleep and their reserve of fat meets all their nutritional needs. Left undisturbed, bears will sleep all winter long, sometimes without even changing position once they are comfortably settled in. Although deeply asleep, bears are easily aroused and can, if necessary, respond and be active very quickly. Like humans, a disturbed bear can be a very grumpy bear. Females give birth to their cubs in winter and together they snuggle until spring. Scientists tell us that bears do not enter into deep hibernation because they require a higher body temperature to meet the demands of pregnancy, birth, and nursing their young. Pregnant females are the first to retire to their dens, followed by mothers and their cubs. Last to settle down are the big males. Female bears have been known to hibernate from the end of September until May and even early June. important motivators in dictating when bears hibernate, the most important factor is whether bears have eaten sufficient amounts to keep them going throughout their long rest. A malnourished bear with an inadequate reserve of fat may not hibernate or will do so only for a short time. of hibernation in bears is to reduce the number of calories burned when food is scarce rather than a response to the frigid temperature. Despite the intense cold that surrounds them, bears burn less than half as many calories during their winter sleep as they do when active in the summer months and do just fine living off their fat reserves. 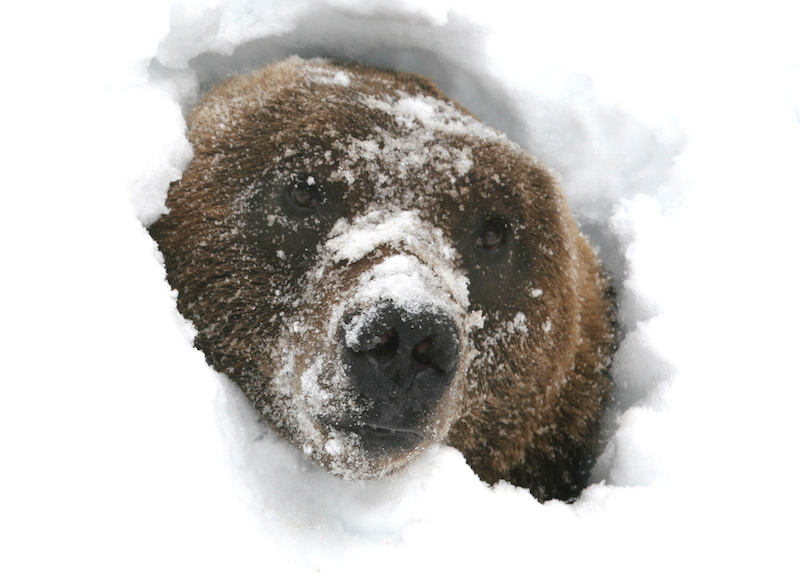 Bears are not choosy and will use many materials or sites to create a winter den. They will often choose caves, brush piles, or hollow trees as well as rock piles and, on occasion, human structures. Some bears seek a little extra comfort and will often line the den with twigs, grasses, moss, or other available vegetation.